Our friends in Academic Workers for a Democratic Union at UC Berkeley recently posted an analysis on their blog explaining why that two percent wage increase we “won” in our recent union contract did not actually ever appear in our paychecks. As UAW 2865 members are now painfully aware, our take home paychecks did not, in fact, see any growth in January, because the expiry of a federal tax credit led to an increase in tax withholding. How much did this amount to? Funnily enough, 2%… So the ‘pay raise’, which our local’s leaders told us was generous, wholly satisfactory and indeed a victory for our contract campaign(! ), turned out to be functionally nonexistent. Clearly, the leadership should have been aware that the tax credit was expiring (the local, after all, does have its own payroll…) and the ‘pay raise’ they were trying to push on us was going to amount to nothing. If they didn’t know, they’re incompetent, and if they did, well, that raises another set of questions about why they would have kept that information to themselves. In the absence of hard evidence though, we’ll assume that our leaders were asleep at the wheel, rather than intentionally misleading members into thinking a 2% raise would have resulted in an actual increase in take-home pay. Had we actually organized a contract campaign, consisting of an educational component, visibility, and, importantly, mass actions, all leading up to a viable strike threat or actual strike, we might have actually built up enough pressure on the University to win more than the paltry two percent wage increase. The contract campaign could have been very different, and it could have helped serve as a precedent for other UC, and public sector workers struggling for fair compensation. The leadership told us it was “irresponsible” to ask for a bigger raise, and that it would be “insulting” to our brothers and sisters working elsewhere in the UC system. This claim is a fundamental reflection of the difference between our approach to organizing and union democracy and that of the leadership. First of all, if it is irresponsible for us to ask for a wage that meets our cost of living and one that reflects the importance of investing in the instructional components of public education – then what exactly is the leadership’s touchstone for what constitutes “responsible” demands? Secondly, given how out-of-touch our leadership is with its own membership, we have a hard time taking seriously their claims about the sentiments of people in other UC unions. Even if their claim is true, we would hope our own leadership would continue to operate on the reality that when we win significant victories, the position of all UC workers improves. Extracting major concessions from the boss gives others increased confidence to fight for and win gains of their own, and it sets a benchmark for all future negotiations. We desperately need a radical change at the top of our local. The current executive board, with a couple of prominent exceptions, is staffed by people who consistently refuse to take advantage of the power of our membership and even act as a barrier to the democratic reform that would force them to do so. What we really need is a reform slate that can dismantle the excessive centralization of power and resources in our local and allow ordinary members to take back their union. In just a few short months, the membership will have the opportunity to debate these questions in the context of the first fully contested leadership election in our local’s history. We look forward to holding the incumbent leadership accountable for their repeated failure to truly advance the interests of Academic Student Employees at the UC. 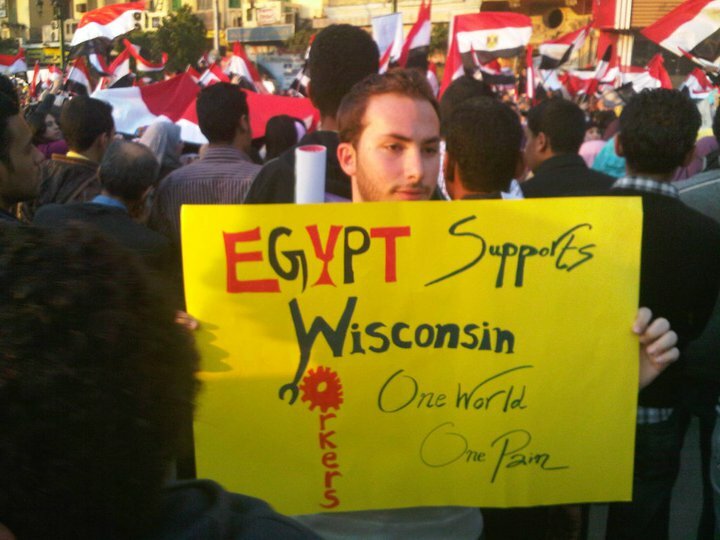 The political quakes that are shaking the Middle East/North Africa and Wisconsin are not simply spontaneous movements of people suddenly disaffected. While there are very few similarities between the revolutions and the union protest in Madison, an essential likeness is that working people and those who are unable to work have long been involved in creating an infrastructure through which democracy and accountability could break through the autocratic or bureaucratic stranglehold of their respective homelands. That infrastructure is not unique, however: in Indiana, Ohio, Michigan and elsewhere, including the University of California (UC), more and more people are joining organizations that fight for the rights of working, and non-working, people. Academic Workers for a Democratic Union (AWDU) is proud of the heritage of the UAW and the many gains it has brought to working people in the USA. It is time, however, for the UAW at the UC, the union representing TA’s, readers, and tutors, to demand more for those it represents and to make demands on an administration that continues to grow wealthy through budget cuts, fee hikes, and changes to the working environment of all of its employees. Only when we band together, across the multiple disciplines and work environments that we, as academic workers, face, will we be able to force the administration to cut its bureaucracy and introduce more democratic and accountable procedures. -run a strong campaign against a flawed contract agreement, which garnered 1400 votes. The “NO” vote lost, but we successfully organized 38.6% of the membership to vote against contract ratification. At UC Santa Cruz, we voted DOWN the contract, with 90% of voting members voting against ratification. -won 40 seats on the local’s Joint Council, one of the important governing bodies of the local, resulting in the largest number of representatives on the Joint Council in at least 7 years, and perhaps in the existence of our local. Academic workers face a far different working environment than the factory workers often credited with establishing the union movement. As such, the organizational requirements necessary to meet the needs of a diverse and often isolated working group cannot remain the same as those developed in different industries. It seems apparent to us that a decentralized and localized union works better and smarter than a centralized and bureaucratized union. We take the events in Madison, WI and throughout the Middle East as confirmation of this thesis. For those with ears to hear and eyes to see, workers and the poor across the world are demanding their right to determine their own future – we need neither a union bureaucracy nor wealthy and self-interested politicians to tell us what we need and how what we want is not possible. It has always been possible for bosses and politicians to feed off of workers and the unemployed, but we are organizing to say no more!